How To Get What You Want & Influence Anyone! Do you wish you could dramatically improve the success rate of your sales pitches? How about directing people to your way of thinking? Ensuring that you know EXACTLY how to get your idea across is the key to success in any business & Tony Johnson gives you 11 of the most coveted techniques to achieve this. Being able to influence is only the start of your journey toward perfecting your sales, marketing & business skills. There’s nothing worse than a great idea but no means of influencing your clients to invest in you! With this book you’ll be set straight from all other ’noise’ about selling & onto the right track with a clear step-by-step process to getting what you want. 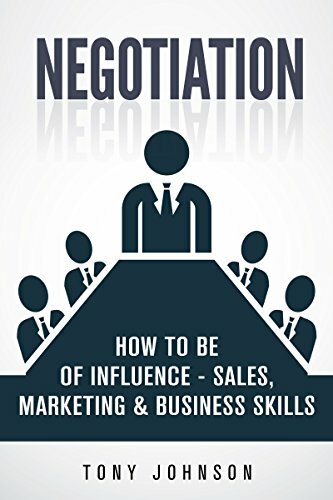 I can guarantee that mastering negotiation has never been easier, countless hours of courses & seminars neatly summed up in this handy pocket guide. 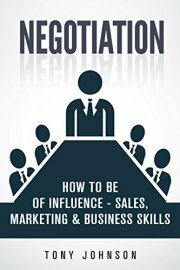 Read “Negotiation: How To Be of Influence” FREE with Kindle Unlimited – Download Now! Don’t regret leaving a pivotal meeting knowing you could have done more! Looking forward to passing my experience onto you, see you inside!